It started out with a 3- or 5- mile run (depending on what participants wanted to do). I chose to just do three because of my IT-band issues but it seemed like most people did five, and Dean ran with the five mile group. 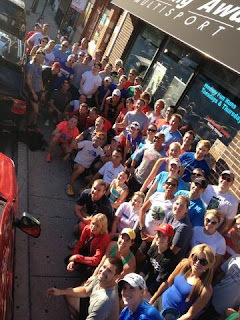 We started at the Running Away Multisport on Clybourn and followed Webster to the lake before turning around. "With a sprint distance... like a marathon..."
But the most honest moment of the night to me was when someone asked him how he maintains balance in his life in regards to his family and friends and he responded by saying, "Did I say there was balance?" and then went on to say that his life (as is the case with most high-achieving individuals) is defined by chaos and a lack of balance. What I really liked about his answer here was that he first pointed out a "flaw" in his lifestyle by saying how unbalanced his life is but then kind of bragged on himself by saying that he was a high-achieving individual. Both of these things are true. And I like that he put that out there. Especially because he could have very easily just said, "Oh, I maintain an excellent balance and always find time for my family." I think that genuineness is what makes him an especially likable figure to follow. Well, that and he's been declared a Superhuman by Stan Lee. At the end of the night North Face did a raffle (he's in town promoting the upcoming North Face Endurance Challenge) and everyone received a signed poster of Dean. Not bad for a free Wednesday night event. I won't be hitting up the Endurance Challenge this year, but maybe next year, once Dean and I have met up at a few more events. The balance response is so honest! Glad you were able to give a recap of this. Treadmill marathon at the Vatican?! YIKES. I appreciate that he's honest about not living a balanced life. Personally I'm sick to death of the whole healthy-living trend of finding "balance." Do what you enjoy. Find happiness. Who cares if it's not balanced. What does that even mean?